Hello, I'm posting this up here for a friend who has had this helmet in his famlies possession for over 30+ years now. 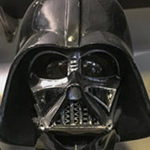 His uncle was a crew member in the UK on the Empire and Jedi films- Years ago the mask was fused to the dome with layers of fiberglass by a family friend so the piece could be displayed. (Hence the strange angle shown in the pictures) Unfortunetly the crew member passed away in the mid 1990s so there are not many known details regarding how it was uptainded other than he received it from someone in the UK studios while working on the films. Just sharing here to get some expert thoughts and opinions about it. Last edited by Sith-Smith on Sun Aug 07, 2016 1:02 pm, edited 4 times in total. WOW..well..from what I see on that cast, the origin story checks out! What are the plans for the cast? Well, I'm definitely no lineage expert, but definitely looks like it is a cast off of something with real lineage. Got some ROTJ look going on with the center strip and over eyes flare. Will be interesting to hear more about this. The dome looks like it was cut into or cast from a ROTJ dome. Who painted the helmet black? Beautiful! That fiberglass "fusion" could be separated probably if someone wanted to work with it. Looks really nice. No known plans at this point. The family would just like to know as much as they can about the piece, since like I said the crew member passed away and it has been a family Memento of his career. Agreed looks like a Jedi dome to me too. Black Paint? That's unknown at this point safe to say besides the glue job the piece has been untouched for a few decades. The dome also reminds me a bit of the ESB Dagobah stunt helmet - being a little choppy on the trim along the edges. Love the detail on the dome - even it was hand painted by the owner a 20-30 years ago. The lines of the faceplate a beautiful - the chin vent shape look very familiar. Would surprise me in the least if this was a very close cousin of the TM in some way. Seriously, thank you for sharing. This helmet is gorgeous. Wow, what a discovery ! 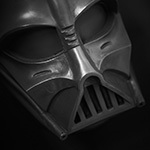 Certainly an ROTJ dome, the face is very much TM including the neck extension and filled in ANH lower mouth vent texture. My theory is that all the various film masks started with an ANH face and the lower mouth vent triangles were hand cut for each cast. This explains why the vent varies in size even within one film. I've just noticed you can even still see the paint masking line below the wearers right eye (above the face of the cheeks face) as the TM shares. And I don't think it's painted, it looks like black gelcoat straight from the mould. Here are some more pictures I got of the same helmet. You can see the fiberglass used to hold the mask to the dome. Wondering if this is similar to how the TM was first found. These are the best photos I have for now I'll work on getting more. I see some TM resembling traits all over that face mask and the dome looks like the early stages of a ROTJ cast. At first glance and if the story checks out, this was an unused production cast.